World champion Vishy Anand and No. 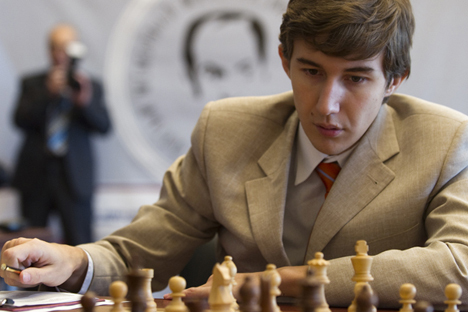 1 rated player Magnus Carlsen struggle to find form at Tal Memorial tournament. Moscow is playing host to a galaxy of chess stars at the Eighth Tal Memorial chess tournament, with 10 of the world’s top players - including four Russian grandmasters - battling it out for a prize fund of 100,000 euros. After six out of nine rounds, the tournament, at Moscow’s Digital October high-tech start-up center, has seen several shock results, including three losses by World Champion Vishy Anand, of India. The world’s No. 1 player by rating, Magnus Carlsen of Norway, has also yet to find his best form, trailing the tournament leader, Japanese-born Hikaru Nakamura, by one point. Both Anand and Carlsen appeared to be have their minds fixed on their upcoming World Championship match, in Chennai, India, in November. Russia’s top player, former World Champion Vladimir Kramnik, has also struggled, scoring 2 points from six games - the same as Anand. Kramnik’s most interesting game, from round six, featured an exciting rook sacrifice in his favorite Berlin Defence to the Spanish opening, and ended in a hard-fought draw. 8-10. Vishy Anand (India), Vladimir Kramnik (Russia), Alexander Morozevich (Russia) 2.0.